Fresh Pre-made Plumosus-Varigated Pittosporum Mixed Garlands are a favorite with flower wedding designers. 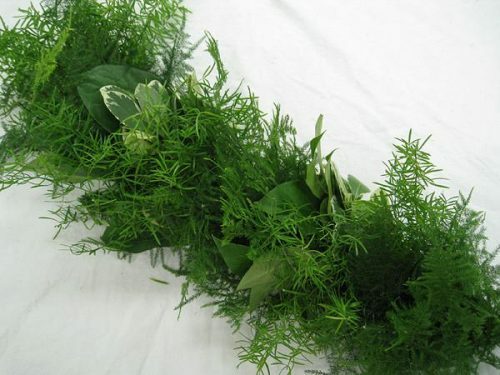 Garlands are a cost effective way to dress up aisle runners, doorways, tables, and banisters. It is also great for home use during holiday and special events. Garlands are sold in 10 feet increments. They are available year round. We always suggest receiving these flowers 2 days before the event. Upon receiving the greens simply spray the foliage keeping the foliage hydrated.